"Sampath Speaking" - the thoughts of an Insurer from Thiruvallikkeni: Bolt among Tortoises - the race and chase by Police - Tortoise speed !! Bolt among Tortoises - the race and chase by Police - Tortoise speed !! 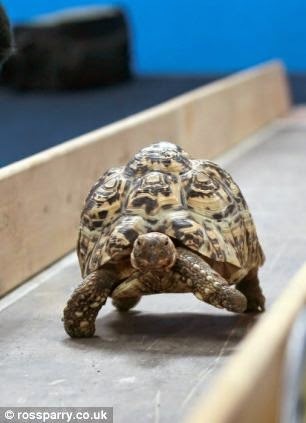 Might surprise some – that tortoises do run races !! - Turtle racing is an event in which participants typically place turtles in the centre of a circle and watch them walk around until one of them crosses out of the circle ~ and some place bets on them too........ incidentally, the Usain Bolt of tortoises is - Bertie who covered 18ft in a world record 19.59 seconds. Last month Daily Mail reported of the young Leopard tortoise that stunned spectators crossing the finish line in less than half the time as the previous record. In fact before ‘Bertie’ came along, the last tortoise to reach anywhere near was back in 1977 when Charlie set the record of 43.7 seconds. The now famous tortoise lives at the Adventure Valley theme park in Durham. It was placed on a specially-built 18ft-long uphill course in front of crowds of visitors. Despite fears he might get cold feet on the big day, Bertie, thought to be around nine-years-old, did not disappoint those who turned up to watch him rocket up the wooden track - even finishing with a victory wave as he crossed the chequered line. Marco Calzini, owner of Adventure Valley, said: ‘Bertie loves going outside for a walk, as soon as we put him down he’s off and running. On his first attempt he managed a time of 21.47 seconds, well under Charlie’s effort at the National Tortoise Championships 37 years previously ........... and then, just to show off - he went on to shave a further two seconds off his time. His keepers and officials from the Guinness Book of Records were there to keep a check on the race. Bertie was given to the adventure park and animal farm three years ago when its owners went to live abroad. The course was made to the exact specifications of the original and included a slight gradient but Bertie, putting fellow animal residents to shame, sprinted off at a cracking pace. He did two runs, first setting a time of 21 seconds then, confidence building, came his personal best. At a third attempt he began to flag but by then he had earned his finishing-line treat which was a cut-up strawberry, a change from his regular grassy diet. The farm is now awaiting an official certificate which will be displayed on a pen shared by Bertie and his female friend tortoise Shelly. 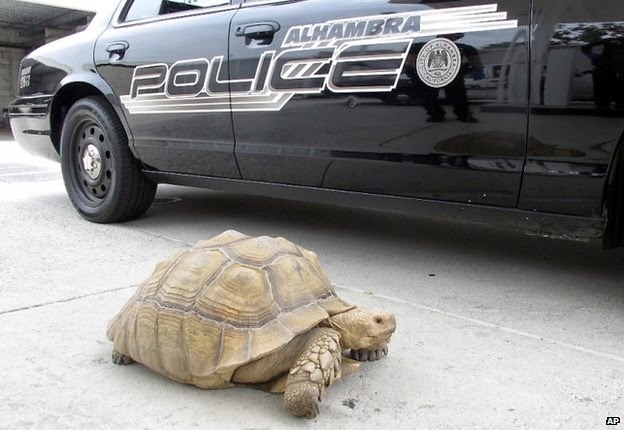 And today, BBC reports of a tortoise in hot chase by Police .... according to the newsitem, 150-pound tortoise was found wandering in Alhambra this weekend ; when found, “the tortoise did try to make a run for it, but our officers are pretty fast,” the Alhambra Police Department said on its Facebook page. Handcuffs, it noted, were “not practical in this situation.” The tortoise is named Clark and belongs to an Alhambra family, the department said. The Police officials took it to the Los Angeles County Department of Animal Care and Control. It is reported that the tortoise took the opportunity to escape from home while its owners were at a ballgame. Its excursion ended midday Sunday, when its owners arrived to take it home. The report further states that California law allows people to keep all types of tortoises as pets, although permits are required for certain desert tortoises. It is stated that Turtles and tortoises sold as pets also must be more than 4 inches long so they can’t be flushed down toilets and into the sewer system, and so children can’t put them in their mouths. Based on photographs taken by police, the catch ‘Clark’ is identified as a sulcata tortoise, a species native to Africa. It is stated that the tortoise appeared to be in good health and looked like an 18- to 20-year-old male. Sulcatas can live 75 to 100 years ! It was unclear exactly how long Clark wandered, but stated n general, tortoises can run as fast as 1 mile per hour “if they really want to.” It took two officers to manoeuvre the 150lb (70kg) reptile into a police car.